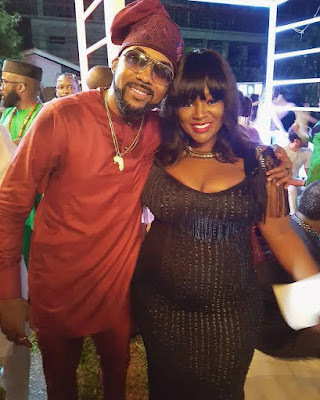 Last Saturday, OAP Toolz and her husband Tunde Demuren revealed that they are expecting their first child together. However, before the announcement, she was hesitant to show her baby bump and had in fact tried to hide it. Taking to her Instagram moments ago, Tolu said that BankyW was the one who encouraged her to announce the good news during his introduction ceremony with Adesua Etomi. "So on Saturday morning I was trying to figure out how to hide my bump with L'osban when @bankywellington says 'Why not just announce it today?...you can just post a pic of both of you saying #TreeADem. I'm like during your intro, won't that be much? Anyhow much later I walk into the venue and 2 people looked me up and down and said congratulations - operation hide-the-bump failed. So long story short, we quickly decided to take a pic and announce things our way.